One of our largest stages and excellent for concerts and festivals. 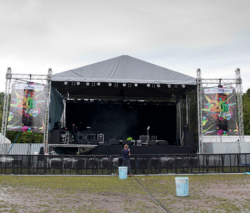 The 12m wide x 10m deep stage roof can be lifted to a maximum height of 6m and covers a maximum stage area of 120sqm. The trussing used in the construction of this stage roof is Milos 390L giving excellent weight loading capabilities. P A wings are available along with a litedeck stage platform . The frame canopies and sides are made from waterproof and flame retardant black pvc. For more information and advice please contact one of the team.